Apr 17 Stressed? Meet Maca, the Powerhouse Plant that's Great for Your Health! I just love adding Maca root to all my morning smoothies now. It’s barely noticeable but packs a real punch when it comes to delivering nutrients. So let’s go over exactly what makes maca so great! "Maca (Lepidium meyenii) is a cruciferous vegetable native to the Andes mountains of Peru. It looks like a radish or turnip, and is consumed both as a dietary staple and as a medicinal herb. The main edible part of maca is the root, which grows underground. Also known as Peruvian ginseng, maca has been used by traditional cultures living in Peru for thousands of years as an aphrodisiac and to combat living in the harsh mountainous climate. Inca warriors consumed maca for strength in battle. There are 13 maca variations, named for the color of their roots. In some cases, different colors of maca can produce different biological effects. The most commonly studied colors are yellow, black, and red," according to Self Hacked. Maca powder is light beige. In this photo, maca appears with turmeric, cacao and spirulina. Lepidium meyenii (maca) is an herbaceous biennial plant of the crucifer family native to the high Andes of Peru. Maca is grown for its fleshy hypocotyl (a fused hypocotyl and taproot), which is used as a root vegetable and a medicinal herb. Maca is the only member of its genus with a fleshy hypocotyl, which is fused with the taproot to form a rough inverted pear-shaped body. Maca does vary greatly in the size and shape of the root, which may be triangular, flattened circular, spherical, or rectangular, the latter of which forms the largest roots. 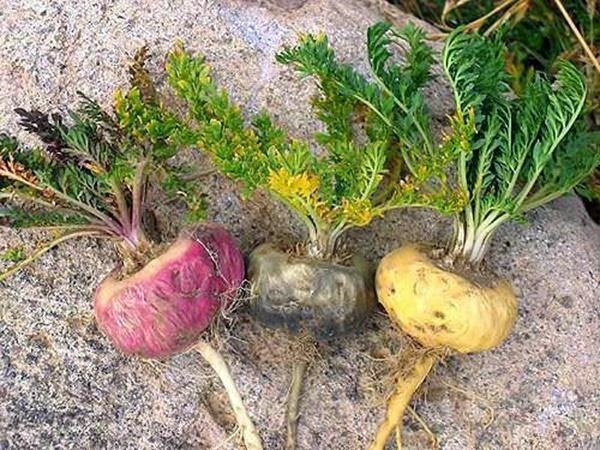 Traditionally, native growers have acknowledged four varieties of maca, based on their root color: cream-yellow, half purple, purple, and black; varying levels of anthocyanin is primarily responsible for the color differences. Maca hypocotyls may be gold or cream, red, purple, blue, black, or green. Each is considered a "genetically unique variety", as seeds of the parent plants grow to have roots of the same color. Specific phenotypes (in maca, 'phenotype' pertains mainly to root color) have been propagated exclusively to increase commercial interest. Cream-colored roots are the most widely grown and are favored in Peru for their enhanced sweetness and size. Black maca is both sweet and slightly bitter in taste. Maca contains 10% water, 59% carbohydrates, 10 to 14% protein, 8.5% dietary fiber, and 2.2% fat. Maca is rich in calcium, potassium, iron, and iodine. It also contains copper, manganese, zinc, vitamin C, riboflavin (vitamin B2), and thiamine (vitamin B1). Red and black maca have high levels of choline. Red maca is high in GABA. The main active compound in maca is the alkaloid macaridine. It has not been found in any other plant. Glucosinolates are active components of maca and contribute a bitter flavor. Fresh maca has 10 times the glucosinolates of other cruciferous vegetables. Red maca has the most glucosinolates, followed by black and yellow. Maca also contains a compound (MTCA), which inhibits monoamine oxidase (MAO – an enzyme that breaks down certain transmitters), which has the ability to mutate DNA. Check out the Maca Collection at Herbal Cafe today! Apr 18 What is Corydalis? How Can it Help Me with Pain?